Award-winning novelist Sara Maitland was very taken with Chris Gollon’s Fourteen Stations of the Cross for St John on Bethnal Green even before the series of site-specific works had been completed. Just when funding had stalled, she kindly funded Station VIII: Women of Jerusalem, which regained the funding momentum. When Chris Gollon had completed the works, they inspired Sara Maitland to write Stations of the Cross in which each Station was reproduced next to the imaginative narrative it inspired. IAP Fine Art then published a collectors edition of only 100, combining a signed book with a signed and numbered print by Chris Gollon. Stations of the Cross + Crucifixion silk-screen print is a special commemorative boxed Collectors’ Edition containing a silk-screen print entitled Crucifixion 11″ x 8.5″ (28 x 21cms) on 300g Arches paper by Chris Gollon, plus a copy signed and numbered by Sara Maitland and Chris Gollon of Stations of the Cross by Sara Maitland (Continuum London & New York 2009). 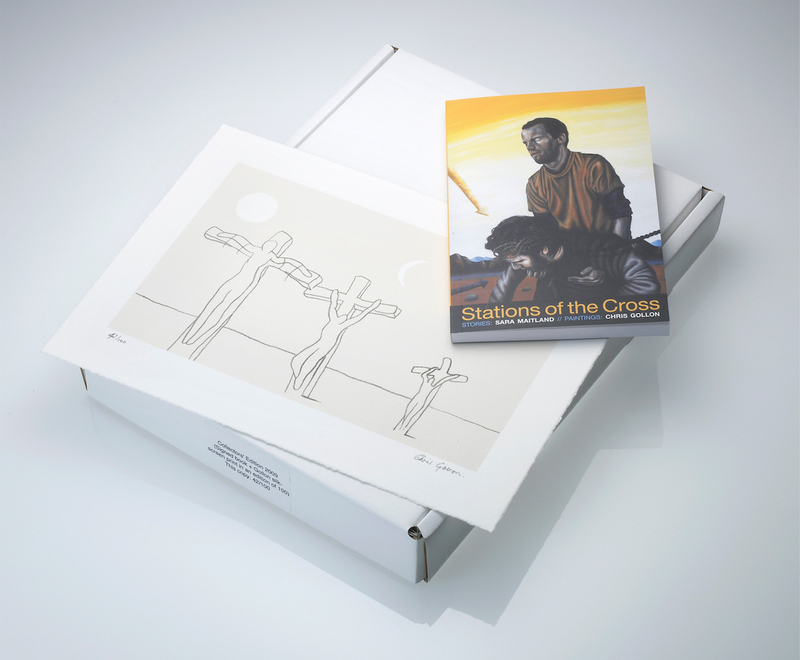 This boxed edition celebrates the permanent installation of Chris’s Gollon’s 14 Stations of the Cross in the historic Church of St John on Bethnal Green, and their blessing by Richard Chartres, Bishop of London in 2009.